Talc (derived from the Persian via Arabic talq) is a mineral composed of magnesium silicate hydroxide. It is extremely soft, with a greasy feel. It is translucent to opaque and has a pearly luster. Its color ranges from white to gray or green, and its streak (color of the fine powder) is white. This mineral serves a number of useful roles. It is widely known for its use in baby powder and cosmetics. It is also a lubricant, a filler in paper manufacture, and a component in paints, ceramics, and roofing materials. Tailor's chalk and the chalk used for welding and metalworking often consist of talc. It is also an additive in some foods and pharmaceutical products. Soapstone, a high-talc rock, is an ornamental stone and is also used for countertops, stoves, sinks, and electrical switchboards. 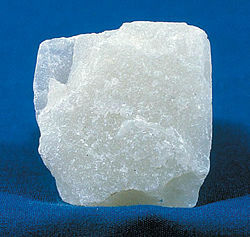 Talc is a metamorphic mineral. It is produced by the metamorphism of magnesian minerals—such as pyroxene, amphibole, or olivine—in the presence of carbon dioxide and water. This process, called talc carbonation or steatization, produces a suite of rocks known as talc carbonates. In the last of these reaction, the proportions of talc and kyanite depend on aluminum content, with the production of kyanite being favored when the rock is more aluminous. Talc is a common mineral in metamorphic belts that contain ultramafic rocks, such as soapstone (a high-talc rock), and within whiteschist and blueschist metamorphic terranes. Prime examples of whiteschists include the Franciscan Metamorphic Belt of the western United States, the western European Alps (especially in Italy), certain areas of the Musgrave Block, and some collisional orogens such as the Himalayas. Talc carbonated ultramafics are typical of many areas of the Archaean cratons, notably the komatiite belts of the Yilgarn Craton in Western Australia. Talc-carbonate ultramafics are also known from the Lachlan Fold Belt, eastern Australia, from Brazil, the Guyana Shield, and from the ophiolite belts of Turkey, Oman, and the Middle East. A notable talc mine of economic importance is at Mount Seabrook in Western Australia. It is formed on a polydeformed, layered, ultramafic intrusion. The chemical formula of talc may be written as Mg3Si4O10(OH)2 or H2Mg3(SiO3)4. The mineral occurs as foliated to fibrous masses. Its monoclinic crystals are so rare as to be almost unknown. It has a perfect basal cleavage, and the folia are non-elastic, although slightly flexible. It is the softest material on the Mohs scale of mineral hardness—its hardness rating is 1. Its specific gravity is in the range of 2.5–2.8. Soapstone or steatite—a coarse, grayish-green, high-talc rock—is heat-resistant and acid-resistant, and is an electrical insulator. Talc finds use as a cosmetic (talcum powder), a lubricant, and a filler in paper manufacture. As a baby powder, it is an astringent that helps prevent rashes in the area covered by a diaper. It is also a component in paints, ceramics, and roofing materials. Most tailor's chalk is talc, as is the chalk often used for welding or metalworking. It is also an additive in some foods and pharmaceutical products. Moreover, soapstone is used as an ornamental stone and for several practical purposes, such as for stoves, sinks, countertops, and electrical switchboards. Several studies have established preliminary links between talc and pulmonary problems, lung cancer, skin cancer, and ovarian cancer. These studies have raised public concern, considering talc's widespread commercial and household use. However, no conclusive study has yet been made to determine the toxicity or carcinogenic nature of talc under normal conditions of human exposure. The long history of safe use suggests that these concerns are unfounded. The U.S. Food and Drug Administration (FDA) considers non-asbestiform talc—that is, talc that does not contain potentially carcinogenic asbestiform amphibole fibers—to be in the group of "Generally recognized as safe" (GRAS) materials that can be used in cosmetics. ↑ In the European Community, the additive number is E553b. ↑ M. A. Hollinger, "Pulmonary toxicity of inhaled and intravenous talc," Toxicol. Lett. 52(2) (1990): 121-127. Retrieved April 14, 2007. ↑ National Toxicology Program, "NTP Toxicology and Carcinogenesis Studies of Talc (CAS No. 14807-96-6) (Non-Asbestiform) in F344/N Rats and B6C3F1 Mice (Inhalation Studies)," Natl. Toxicol. Program Tech. Rep. Ser. 421 (1993): 1-287. Retrieved April 14, 2007. ↑ "Health effects of mining and milling talc," NIOSH Worker Notification Program. Retrieved April 14, 2007. ↑ B. L. Harlow et al., "Perineal exposure to talc and ovarian cancer risk," Obstetrics and Gynecology 80(1) (1992): 19-26. Retrieved April 14, 2007. This page was last modified on 12 November 2015, at 15:42.